The Challenge: Many companies capture large quantities of customer data. But few use the data to deliver a competitively differentiating customer experience. Pizza Hut is asking customers to provide their preferences and using that information to deliver preference driven communications and pizzas. Recently, Pizza Hut shifted to more personalized customer interactions by segmenting its customer base into 6,000+ groups based on characteristics, purchase tendencies, and behavioral indicators. Juliana Lim, Senior Marketing Director for Pizza Hut, says, "We now run targeted campaigns built with intelligence around customers' preferred product categories, typical purchase times and channels of choice”. 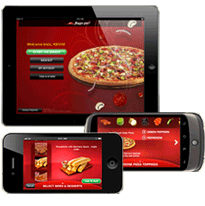 Pizza Hut provided customers with a registration process to define their personal communication and pizza preferences and delivery instructions. Customers can order online, via traditional call-in, via a mobile site, and even via an ordering app on an Xbox 360® system. Online registration allows customers to get exclusive deals, save “fast favs” for quick reorders, and even set pre-orders for up to 7 days ahead. Up to 6% extra sales generated every month since the program started. Findings from research conducted by our company ERDM, indicate that today’s savvy online shoppers understand that in order to receive more personalized offers and communications, they must provide more detailed personal preference information. If they trust the brand… they are willing to provide preference data in order to receive a significantly improved customer experience. They receive fewer communications that are not relevant. Provides the flexibility to change their preferences as their needs or situations change. Increases their awareness of product, offer and ordering options. Allows them to spend less time looking for products. Personalization is perceived as a service. Customers want the ability to set personalization preferences. So, tell your customers that true personalization is available and the benefits they will experience. Customers want to be involved in their experience with your company. Customers want to contribute to, and define their relationship with your company. Make it easy for them to do so. Consumers recognize that in order to receive relevant information, they must share increasing amounts of information regarding personalization and preferences. By providing a way for customers to tell you what they want from your company they will be more likely to open, engage with, and respond to, communications and offers.